The saline solution (also called a physiological solution) consists of water and a little NaCl (table salt) and it is normally present in the body. It doesn't serve as a filler because the "bump" that forms when you inject is absorbed within hours. You just inject water under the scar, that is all. It serves the same purpose as the suction method - to stretch out the fibrotic bands that tether the scar down and make it indented and to trigger collagen production. It is injected straight after a subcision or needling. If you inject the solution with quite some pressure, you will cause a very mild injury to the tissue (which is good because it triggers collagen) and it can take several days to heal. During this time, the scar will be flat. However, if you managed to loosen the fibrotic tethering, the scar will end up permanently slightly less indented, especially if you repeat the injections for several months. A cotton ball can be squeezed until none of the vit. C solution remains. Thank you, jwaduveev, for taking time to describe your experience. Please keep us up-to-date occasionally. Dermarolling / Microneedling / Re: What to apply? BTW, oils are much better moisturizers than any moisturizing cream because oils form a film on the skin that prevents water evaporation from the skin and thus keeps it extra moisturized. Using water-based creams or glycerin on the skin does not moisturize it for more than several minutes. Topically added water actually increases the evaporation of water from the skin. The skin contains enough water. The top layer of the skin works as a barrier that prevents evaporation from the skin. If this barrier doesn't work properly or is temporarily compromised, the skin becomes dry. Adding water does not solve this. Establishing a barrier that prevents water evaporation solves it. Unfortunately, oils often cause breakouts. Dermarolling / Microneedling / Re: which products to purchase for this type of scarring? You can try a 0.5% Tretinoin because your main problem is the pigmentation. Your scars are very mild and there are just a few. No, do not use Infadolan on your face because it could cause breakouts in your case. Dermarolling / Microneedling / Re: prep and aftercare. Infadolan has vit A & D and I think it is more appropriate than bio-oil, which has A & E.
In addition, Bio-oil is a gimmicky product supported by a massive, expensive marketing/spam effort, but seen the very long list of useless ingredients (twelve fragrances, two colorants etc.) and the fact that they do not list the amount of vit. A and E in their formulation, I'd give it a pass. They claim on their site: "highly effective for numerous other skin concerns, including aging skin and dehydrated skin." That's just nonsense in my opinion, making them scammers in my book. I cannot give a recommendation because everyone reacts differently and what is OK with one person causes breakouts in the other so people should apply a cream that they know does not cause breakouts from personal experience. Do not apply harsh substances such as benzoyl peroxide, acid peels etc. It should be moisturizing, not drying. Infadolan has a very low percentage of vit. A and the producer claims it can be used during pregnancy. Infadolan is intended for dermarolling aftercare. apply it (just a little is enough) daily on the back of your hands because it will protect the skin, make it supple and improve its crepeness. You will get results even without pretreatment. The best treatment for crepey skin is a combination of a short needled dermaroller (0.2 or 0.5 mm) used several times a week (apply a cream of your choice) and a long needled roller (apply Infadolan afterwards). The more you moisturize after dermarolling the better. For your arms, prior to dermarolling, give it a good scrub with a pumice stone. Let it heal from the scrub and then dermaroll. I answered you yesterday but I have accidently posted it somewhere else. Yes, you can combine the A-ret and silicone. If you want to apply it right after needling, a silicone sheet is a better idea than a silicone cream (kelo-cote) because it is not a good idea to get silicone into your bloodstream (which may happen in case of silicone gels or creams. Normally, the skin is impermeable for most substances, including silicone but needling will enable the substances to penetrate. The effects of silicone should be limited to the skin's surface and there is absolutely no reason to be getting it deep into the skin. You can start applying a silicone gel or cream a day after needling. Thank you for the compliment, I forwarded it to the people that do the dispatching. If you want to apply silicone right after needling, a silicone sheet is a better idea than a silicone cream (kelo-cote) because it is not a good idea to get silicone into your bloodstream (which may happen in case of silicone gels or creams. Normally, the skin is impermeable for most substances, including silicone but needling will enable the substances to penetrate. Dermarolling / Microneedling / Re: PI Hypopigmentation on my face from Mederma scar Gel!!! surrounding area into the hypopigmented patch. No, you do not have to prepare your skin in any way for stamping. 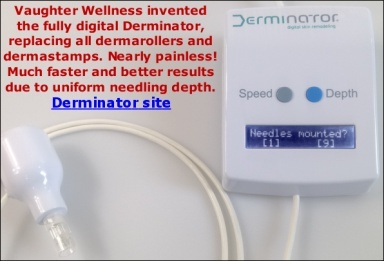 Yes, you can use a 0.5 mm dermaroller. I actually think that your face may be lighter due to sun avoidance/protection because if the laser destroyed/compromised melanocytes (pigment producing cells) the facial skin would become blotchy since the laser would not cause perfectly evened-out damage. I am surprised Mederma caused hypopigmentation. Skin pigment (melanin) is produced by melanocyte cells. They are at the bottom of the epidermis which is only about 0.1 - 0.3 mm deep in the skin. You can try stamping your areas three times a week with a 0.5 mm dermastamp. Microneedling often triggers new melanocytes or it "wakes them up" but it is not always successful. After a month or so of stamping, expose your face to the sun. Melanoctes produce melanin upon sun exposure. You seem to have post-acne hyperpigmentation and just a few scars. I recommend you a 0.5 mm regular dermaroller (roll your whole face up to three times a week) and a 1.5 mm dermastamp (the one with 35 needles not the one with 80 needles). Stamp the scars every three weeks. You can also try our Tretinoin cream. It keeps acne under control and it helps with pigmentations. Are your stretch marks red or white, raised or indented, where do you have them and do you have many?